While it’s true that water doesn’t cure everything, drinking plenty of it can help prevent a whole lot of health issues! Because of how big and tall I am, my body requires more water than most, but it’s not so easy to remember in my busy life. I have to come up with fun ways to drink more water, or else it just doesn’t get consumed as much as it should. It can be a little tricky to get my kids to drink more too! Here are some of our favorite ways to drink more water! 1. Find a FUN Water bottle! I bought 3 of these Contigo water bottles in 3 different colors because I love them so much! They come in so many colors and do not have built-in straws that tend to be hard to keep clean! Make sure your water bottle is small enough to be portable but big enough that you don’t have to refill it constantly! 2. Water Enhancer. I don’t want sugar or artificial sweeteners in my water. That’s why I was so excited to find STUR. It’s a water enhancer that comes in 5 different flavors (my favorite is strawberry watermelon!) It is all natural and sweetened with stevia. I love that I can squirt a little or a lot in my water to flavor it the way I want. I just have to hide it from my kids or else it’s gone in a day! True Lemon, it’s amazing! They have everything from lemon, lime, or orange packets to flavor your water or lots of different lemonades! My favorite is the Black Cherry Lemonade and the Raspberry Lemonade! 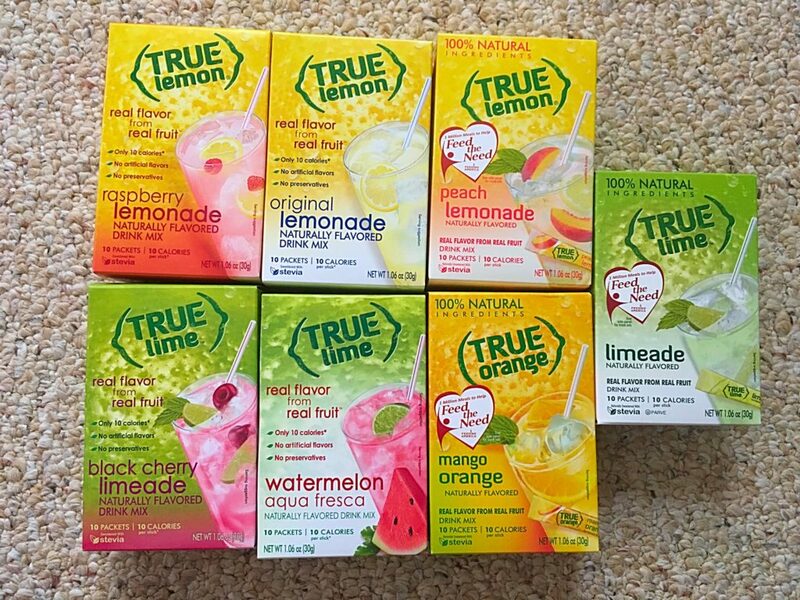 All of their powders are all natural with real citrus crystals and their lemonade is sweetened with stevia. I usually dilute their lemonade with double the amount of water and it lasts twice as long and still tastes great! My kids can’t get enough of these little packets and I love that they aren’t consuming tons of sugar! 4. Flavored Ice Cubes. If you’re trying to cut down on your favorite sugary or artificially sweetened drink, but aren’t quite ready to give it up completely, this is a great option! Freeze it in ice-cube trays and then add them to your water! You will be consuming more water and less of the sugar! These ice-cube trays work great for popping the cubes out! 5. Sparkling Water. My dad LOVES soda, but he is a diabetic and tries to avoid it more now. Sparkling water with a touch of juice or any of the above mentioned flavor enhancers work great at curbing a soda craving! 6. Fun ice cubes and straws. This works great for kids too! Here are some fun silicone molds you can also use for ice and some fun straws. You can also add little diced up pieces of fruit to the ice cubes before you freeze them to make it fun! 7. Fruit Infused Water. 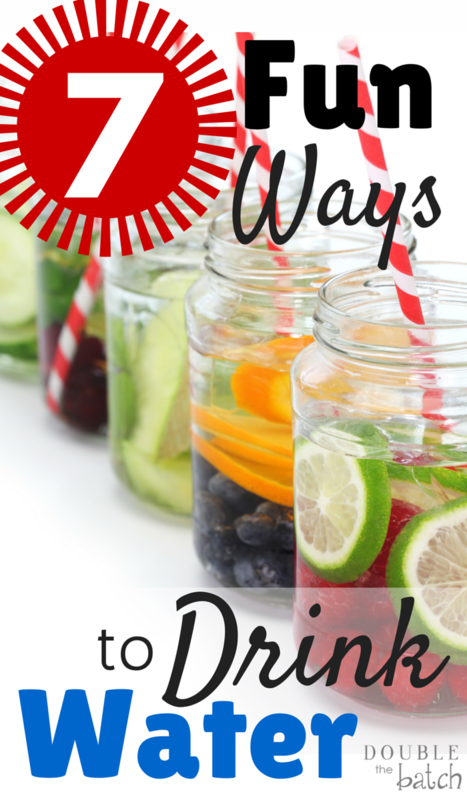 Here is a great post from Mother’s Niche on how to infuse your water with fruit! Now, if you’ll excuse me, writing this post has made me thirsty! Good luck in finding more fun ways to drink more water! The Slow Dance You Never Want To End and 4 Ways to Keep it Going! 10 Things I Knew I Wanted In A Man, By Watching My Dad!